Photographers, travelers, techies, and adventurers alike will fall quickly for the Peak Design Everyday Backpack. The best versatile backpack will be easily adjustable, well padded, functional, and have the small details to truly set it apart. When you start diving into the Peak Design Everyday Backpack, you’ll quickly realize it meets this criterion. The creators of this backpack were striving for a backpack that adapts to your ever-changing environment. They wanted it to meet your creative and adventurous needs. So, they have designed this backpack to keep you comfortable and your gear organized and safe. So, if you’re ready and willing to learn how this is such a phenomenal backpack, read on. Twenty liters can fill up fast when you’re trying to keep things safe and secure. The Peak Design Everyday Backpack has been built to make the most out of this space, though. With one large, main compartment, you can hold quite a bit. If this means a camera for you, then you can insert the sub-dividers to break the main compartment down into multiple smaller ones. For example, you can carry a DSLR with multiple lenses, each in their own little space. These dividers are ingenious and easily moved depending on what gear you need for the day. On top of that, the Peak Design Everyday Backpack allows you to access the main compartment from the side. The shoulder straps are allowed to rotate on a rivet, allowing you to bring the backpack in front of you while keeping it on your shoulder. 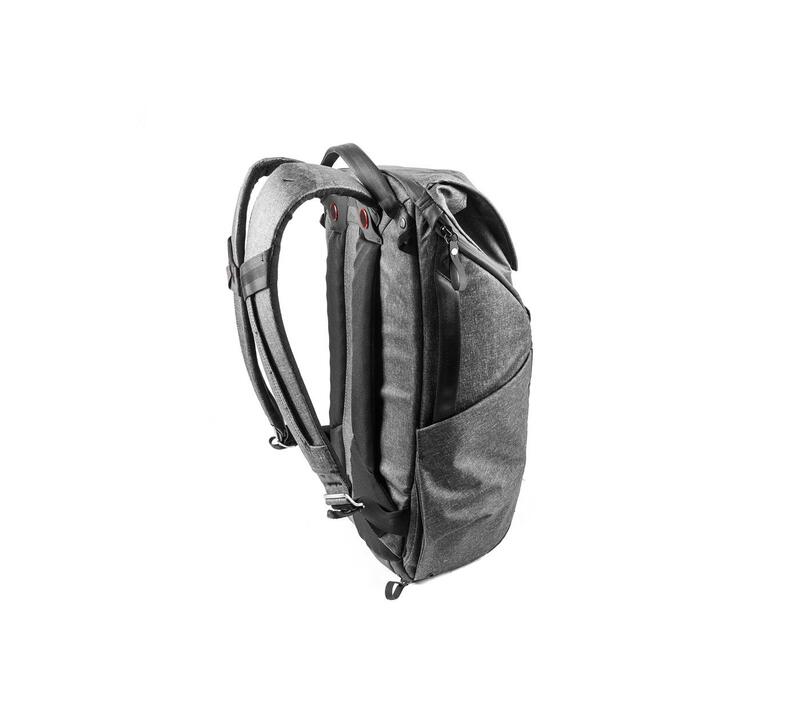 Then, zip it open and you can access the bottom-most compartment of your backpack without taking everything else out. Hopefully, you’re starting to see all the details that set this backpack apart. Many of us have different uses for our different pieces of technology. The Peak Design Everyday Backpack has been designed to carry both a laptop and a tablet safely, along with the rest of your tech gear. You can access these sleeves without even opening the main compartment, either. This makes it simple to whip either out quickly. The laptop sleeve can hold up to a 15-inch MacBook Pro, which is probably the largest laptop you would be carrying around. So, if you like to bring your editing software when you’re on site, then the Peak Design Everyday Backpack is a great option to help keep all your gear safe. A backpack isn’t reliable if what its made out of won’t last a lifetime. The Peak Design Everyday Backpack is made of soft yet solid cotton and twill with a Hypalon-reinforced exterior. The Ash color backpacks use natural Nubuck leather instead of the Hypalon, but both are incredibly durable. All the hardware is made of anodized aluminum, giving you a plastic-free backpack. This means less moving parts to crush and break, leading to a longer product lifetime. Their patented MagLatch system is incredibly secure. With one hand, you can latch and unlatch it while keeping things quiet and secure. The Peak Design Everyday Backpack is not a fully waterproof backpack. However, it is water resistant for quite a while. But, with all the equipment you’re carrying around in your backpack, we doubt you would stay out in bad weather long enough to even think of compromising something. So, for a backpack with incredible material quality and innovative usage, this is it. Sometimes a twenty-liter capacity is not big enough when you need to carry around a drone or other large items. So, Peak Design included a configuration of four tension straps that let you strap things on with ease. They tuck away within a magnetically sealed pocket, so you don’t have to worry with them dangling about when not in use. Two straps are sixty centimeters long, while the other two are forty centimeters long. They are made of high strength 15-millimeter webbing and the signature anodized aluminum hooks. To customize your attachment, there are ten discrete anchor points to let you cinch down just about any type of gear. So, while this pack is only twenty liters, it can hold quite a bit more with the external carry straps. 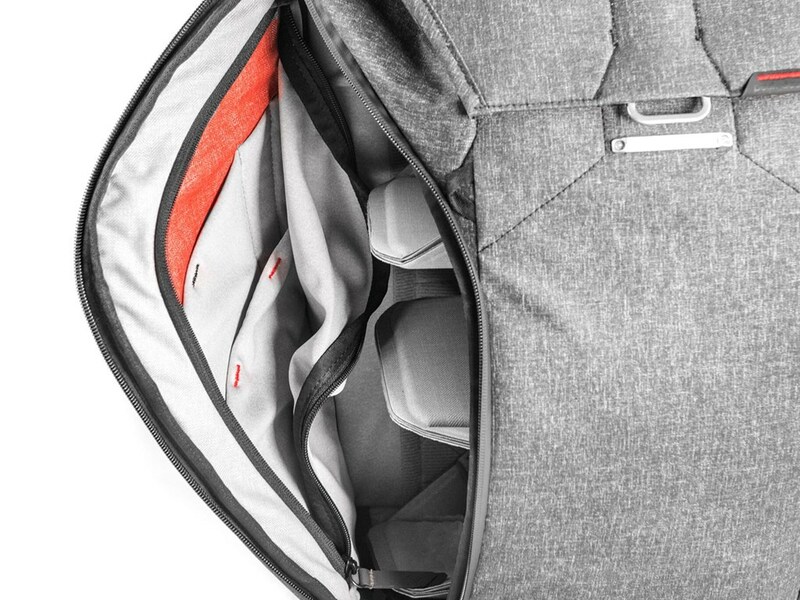 No stellar backpack is complete without a solid internal organizer. Inside the side flaps of the Peak Design Everyday Backpack is an extensive pocket collection. There are a variety of sizes, allowing photographers to organize their memory cards, batteries, filters, and just about anything else around that size. One of these side pockets has a key tether inside to keep your essentials safe, too. Lastly, they can easily be used as a water bottle or tripod holder, depending on your need. Whenever you are carrying a bit of weight, it is nice to have a solid sternum strap to keep the shoulder straps in a good spot. 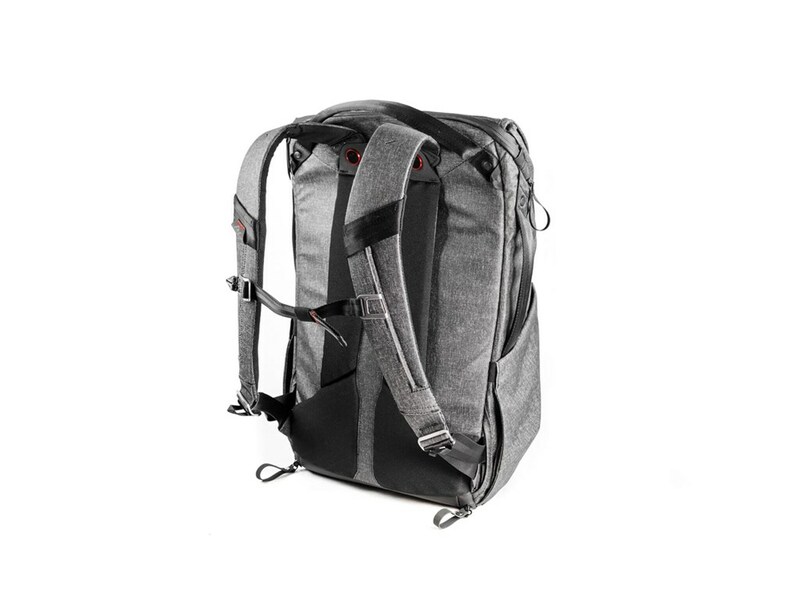 The Peak Design Everyday Backpack has solid sternum strap with no moving parts, so it will last and last. The shoulder straps have axial attachment points allowing you to swing the bag in front of you to access it without taking the whole thing off. This is just one more of the little details that Peak Design has put into their bag to make it a top of the line purchase. Boasting 4.3 out of 5 stars from over one hundred and seventy photographers, travelers, and commuters, this is easily a phenomenal backpack. The most loved feature is clearly the versatility and customizability of the main pocket. Photographers and other gear junkies love that they can make this backpack fit their needs to a T by moving a few things around. There are small other features that most customers say they are everything they ever wanted but never knew they needed. One example is the carry handles on the sides. With a traditional carry handle, you have to bring your arm awkwardly high to keep the backpack up. With the side handle, you can carry this like luggage: with ease and maneuverability. Overall, these two things and the overall attention to detail in the construction of zippers and the MagLatch are what set this bag apart. A few reviewers of this bag have mentioned their less-favorite parts of the Peak Design Everyday Backpack. First off, for over two hundred and fifty dollars, they were hoping this bag would be waterproof or come with a rain cover, but it does not. It already goes to such great lengths to protect your gear, so why not add in the one last piece needed? On top of that, customers do not like the black color, as it shows any minor lint, dirt, or other things you come in contact with. The lighter colors actually hide everyday wear and tear much better. A few of the backpack users find the straps a little stiff, but many say then your backpack isn’t packed correctly. So, in the end, this backpack is spectacular for most people, but for others, it might not be made for you or your body type. Designed for the commuter, by the commuter, the Timbuk2 Command Laptop Messenger Bag is ready to keep you and your gear safe from point A to B. There is a large, internal pocket for your main items, as well as an external zipper pocket for quick access to your power cords or other essentials. There is an internal organizer under the front flap for you to organize your phone, pens, and a wallet. All of your things are kept safe through the TPU lined, weatherproof flap and bag material. This bag has been approved by TSA to keep your laptop in while going through security, which makes travel a breeze. Unlike the Peak Design Everyday Backpack, this crossbody bag is more of a traveling or commuter’s paradise. The closure is similar, with aluminum hooks and webbing loops too. 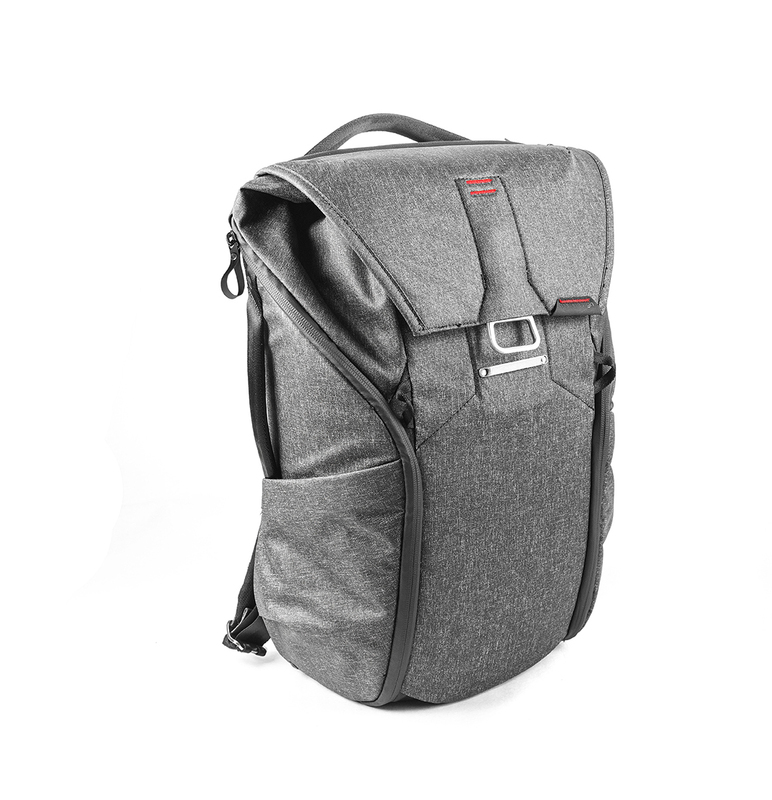 All in all, the Timbuk2 Command is a laptop bag for someone needing a durable and waterproof bag for around the city. 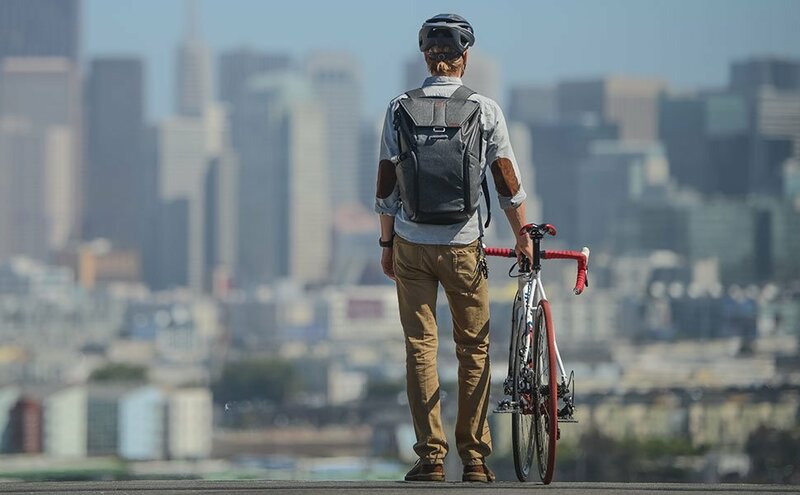 One of the most beloved travel backpacks is the SwissGear Travel Gear 1900 Scansmart TSA Laptop Backpack, and we understand why. It is made with intense ballistic polyester to withstand any harsh condition you might find. With a ScanSmart technology, you can quickly go through security hassle-free with an up to a 17-inch laptop. It has a front organizational pocket for your needed small items. The large main pocket has space for your computer and the rest of your items. Two breathable side compartments are perfect for a wet umbrella or water bottle as well. The comfortable shoulder straps and airflow back panel are widely praised by all who wear this for its comfort. So, if you’re looking for a much more budget friendly but well-loved backpack, check out SwissGear. This iconic Swedish company has risen to the top of the best backpack brands in the world. The Kanken Classic Pack is made with water and dirt resistant Vinylon that can be wiped clean. The handles and straps are made of premium, durable webbing to last a lifetime. This pack fits sixteen liters and can fit most fifteen-inch laptops. So, if you’re looking for a simple and small backpack for everyday use that can still carry your laptop, check out Fjallraven’s Kanken Classic Pack. It is a much lower priced alternative to the Peak Design Everyday Backpack. All in all, the Peak Design Everyday Backpack is the best option for the professional photographer or intense organizer. The thoughtful and innovative design has been woven into every single element of this backpack. If you’re a details person and can appreciate the little things, the Peak Design Everyday Backpack is for you. The Peak Design Everyday Backpack is the essential go-to backpack for any photographer or gear tech.